A new poll in Iowa makes it official: Iowa is a tossup; it is an exact tie now, one of two states that are tied now. Minnesota is the other one. 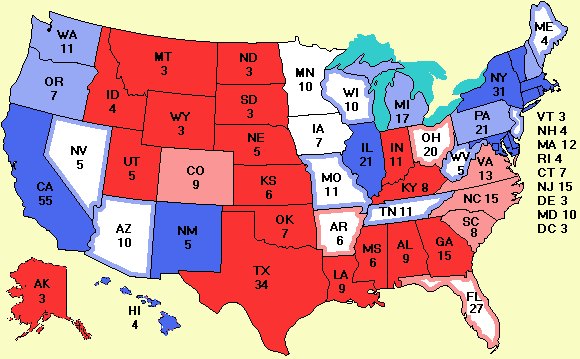 Another poll in a key state, West Virginia, puts Kerry slightly ahead there for the first time in 6 weeks. A poll in Alabama reaffirms Bush's lock on this state. The More data page has been updated to include a link to Nationmaster.com, a veritable cornucopia of election data including presidential election maps going back to George Washington. One caveat though. That site uses blue for Republicans and red for Democrats, so don't panic at first glance. Another addition to the More data page is a link to a cartogram of the 2000 election results. In a cartogram, Connecticut is more than twice as big as Wyoming because it has twice as many electoral votes. Several people have suggested using cartograms instead of traditional maps, but I think they are too confusing for a map of the U.S., which everyone has seen thousands of times.